Visiting Alaska is a dream vacation for many. Meanwhile, most trips aren’t planned during the winter months rather during the summer when it’s warmer and greener in the Land of the Midnight Sun. Rest assured there are plenty of reasons to visit in the winter and they start with our endless ice fishing opportunities. Ice fishing season begins in November and runs through March, and the good news is you don’t have to wander out of Anchorage city limits to find quality opportunities. In the confines of the Anchorage Bowl anglers have more than 50 waters to ice fish. Include the Mat-Su Valley and the number rises to close to 200. Ice fishing opportunities are endless. Selecting a lake is made easy with the use of the lake database through the Alaska Department of Fish and Game website. However, local favorites such as Sand Lake, Jewel Lake, Delong or Little Campbell Lake are no secret. These lakes are stocked regularly and full of fish. 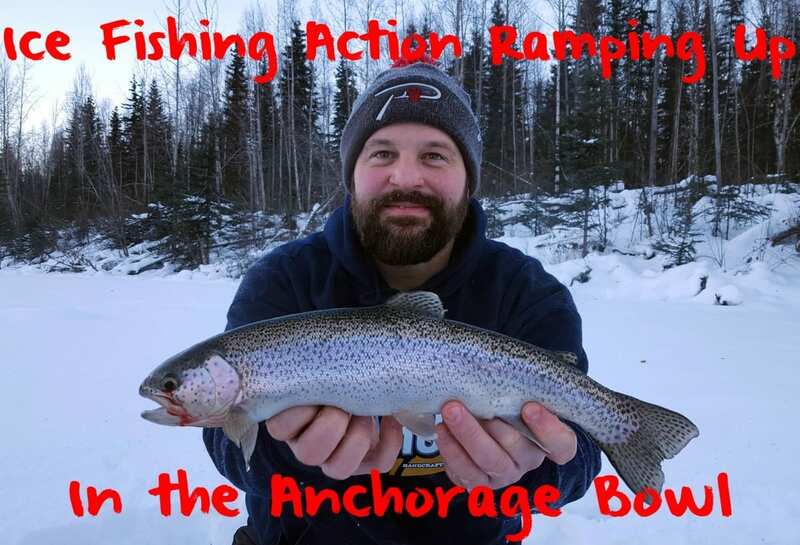 One of best things about fishing in local Anchorage lakes is multiple species are available such as arctic char, grayling, rainbow trout and landlocked salmon. In the last week we hopped around several locals lakes in the Anchorage area and found consistent action on larger trout and typical planters. We employed light-action St. Croix ice rods loaded with four and six-pound P-Line fluorocarbon. Regardless of which lake we fished we always used a 1/32-ounce jig tipped with Fire Brine shrimp. It only takes a small piece of shrimp, roughly the size of your fingernail to tip your jig. With a plain jig bites are tougher to come by. Brining shrimp couldn’t be easier and allows you to change the appearance of your baits and separate yourself from others. Brined shrimp has become a mainstay. I let my baits soak in Fire Brine for 24-48 hours. The longer the soak the more vibrant the colors get. Keep in mind, brining shrimp doesn’t take away from the natural scent of your bait. There’s no scent in commercial brines, although you can add some if you’d like. I’d recommend bringing several colors of brined shrimp. What worked yesterday may not work today. And, what works today may not work tomorrow. We found success with natural and red one day and then pink the next. Shrimp can be fished by jigging or dead sticking. Here’s a blog that covers exactly how to brine shrimp. To be successful on the hardwater do a map recon on the lake that you intend to fish. Look for transition areas from gravel bottoms to weed lines or drastic changes in depths. These areas typically harbor trout and baitfish, which trout feed on. While you will likely find trout in 15 feet or less, don’t be afraid to fish in as shallow as three feet of water. Editor’s Note: Be sure to check regulations to ensure you are fishing in bait friendly waters. Dustin Slinker operates The Bait Shack. For his guided ice fishing trips please visit https://www.facebook.com/thebaitshack or http://www.thebaitshackak.com.